That's odd, it must be a different model from mine. I just went to take a photo, but the crank gets in the way. There is only one circle of thread visible either side on mine when it is fitted. Yeah....odd. Can't find much in the way of sizing on any of the documentation online (Mavic manuals etc) and there isn't anything on the shell to suggest which model it is - other than a 9012c number - which doesn't offer up much in Google searching. As I say - I took a punt on it and it was a reasonable price. I think I can make it work. 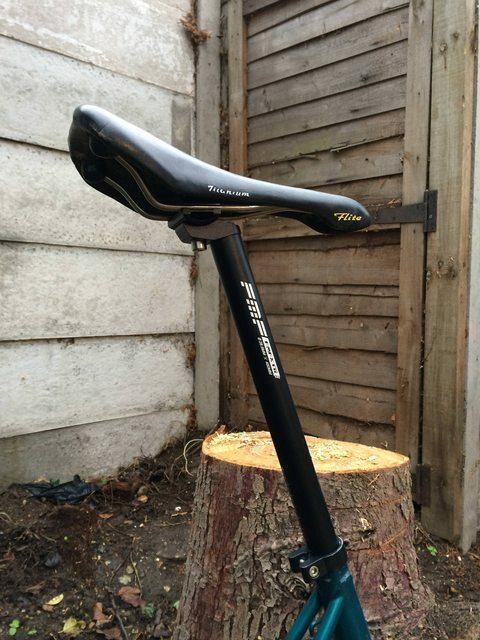 Long seat post turned up yesterday from China.....a lot quicker than expected it has to be said. Shame about the amount of white graphics on it but the finish is really nice - exactly what I'm after. 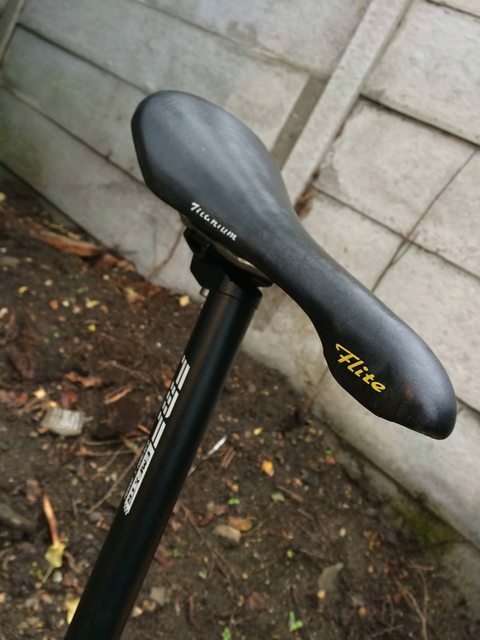 Married it up to an old Flite Titanium Alpes that I recovered with fresh leather a few years ago.....I've ridden these saddles for a while so my behind is quite adapted to the lack of padding......I'll be running with this I think. Long quill stem ordered last night from China-land......to match the lofty seatpost. Nice, if that seat post is longer than mine and they do a silver one I might consider ordering one. I have a very late one in original paint, which now has BMX-sized wheels, a Campag Record front hub (it was lying around in the spares box) and a rather funky Sachs Duomatic 102 2-speed kickback rear hub which I bought from some shyster in Germany with an incorrect brake cone fitted, so it wouldn't work until I managed to track down the right part. No cables to the rear of the bike at all. I bought the bike for a tenner because it had apparently only been ridden on its maiden voyage, straight into a wall which had bent the fork right back. 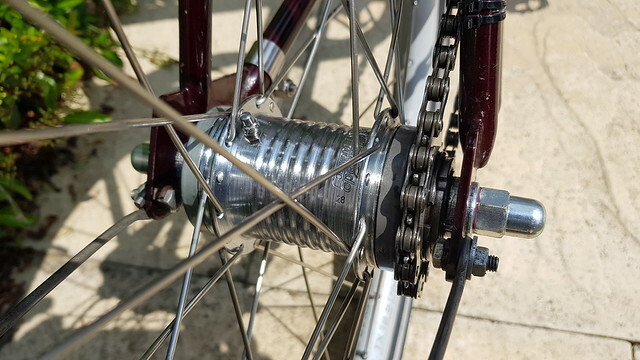 The head tube and frame were absolutely fine so I fitted a chromed BMX fork with V-brake bosses. 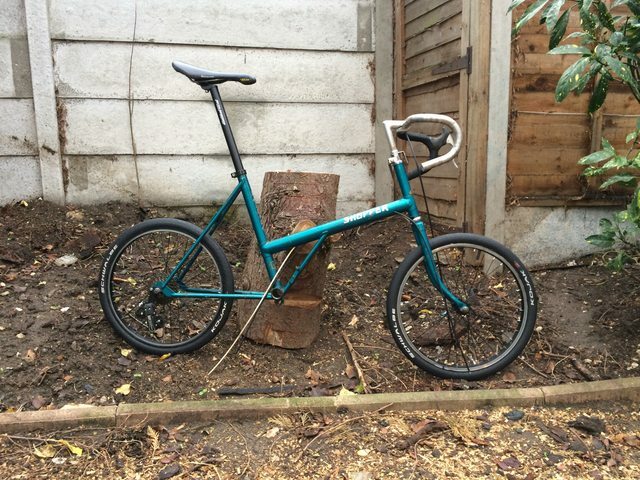 It stops better than your average Twenty, with a front V-brake and a rear coaster brake. Cool - love this. Have you got any more pics? Here's my Twenty build thread from a few years ago. 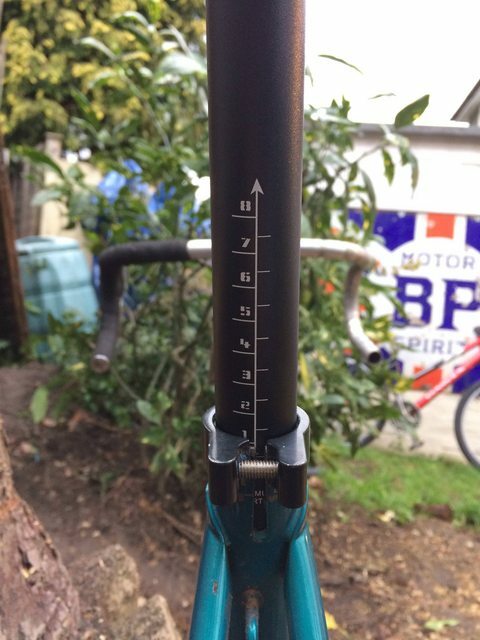 The best way to deal with the BB is to cut it down to 68mm and recut the threads. Nice job, did you know there’s a Twenty FB page ? Lots custom builds on there. I restored a Kingpin a few years ago, still got it, it brings lots smiles when I ride it. Twentys seem to have become popular all of a sudden. This link has some history. I’ve just accidentally bought a puch picnic and a Raleigh twenty!